Been learning about the planets in space. We performed our assembly all about space for our parents. In English we wrote our own space poems all about what we would see, hear and feel in space. In PE we have learnt some new games and played tennis! In art we made our own planets by rolling balls in coloured paint. We have designed sand aliens ready for our beach trip. In art we have made clay aliens, we then painted and varnished them. In maths we have been learning about halves and quarters. We have been learning space poems and performing them. We have learnt to sing some space songs. In English we have been reading books by Dr Seuss our favourites were The Cat in the hat, There's no place like space and Green eggs and ham. In English we have learnt lots of fairy tales and we have written our own space stories using Hansel and Gretel and Rapunzel to help us. In Maths we have been working on adding and subtracting and we have been learning our number bond to 10 and 20. In Art we looked at the work of Peter Thorpe who makes abstract space paintings. We designed and painted our own space backgrounds using colourful paint and printing. In ICT we learnt about coding, we had to give the computer instructions to make things move. In English we changed sentences form Hansel and Gretel into the past tense. In Maths we were comparing more than, less than and equal to. In Art we made rockets with colourful flames. We had a visit from the planetarium. We crawled inside the dome and saw a show about the planets and stars. We learnt stories about Orion and his dog Sirrius. We have learnt a song called "Spaceman Sid" in music. In art we made our own Earth collage. In Topic work we learnt about the first person to land on the moon. He was called Neil Armstrong. In Maths we have been counting forwards and backwards to 100. In English we have made a space book of all the thingts we know and want to find out about space. We started off our topic with a 'Wow day' trip to the zoo. This week we have been writing poems about zoo animals. We have been learning how to add and subtract using part, part, whole. In DT we have been learning how to sew and starting to make our own zoo animal puppets. In Geography we have been learning about continents and seas. In music we learnt a song called 'Big Bear Funk'. In PE we played with the parachute and we learnt how to use a ball and doing obstacle races. The last few weeks have been great fun! In English we all chose an animal to research and have just finished writing our information texts about our animal! This week we have just started instruction writing, Year 1 created dice and Reception made jam sandwiches! In Maths we have just finished a topic on fractions where we were finding halves and quarters of shapes and numbers. This week we have been focusing on time, and have been working really hard to read o' clock and half past times, and draw the hands on the clock to show these times. 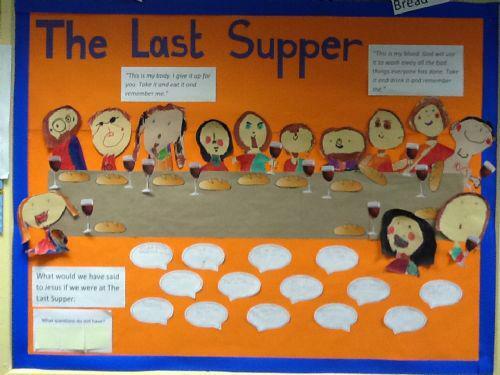 In RE we have been learning about Mass and The Last Supper; we made a really good display for our classroom all about this! In Art we have been making animal masks, we are going to use these in our upcoming assembly! We're really excited! We have just been given our words to learn and have been practising our songs. 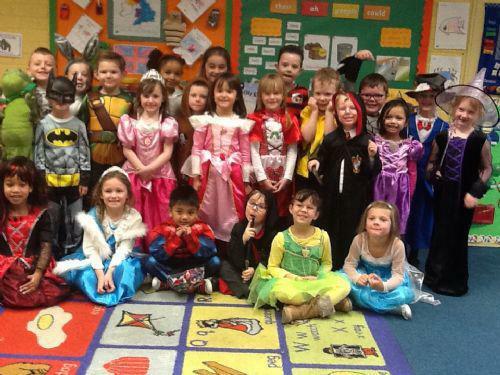 Last week was World Book Day, we did lots of fun things including making our own books and designing book tokens! 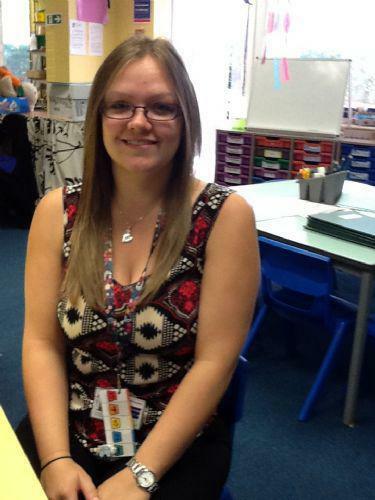 This term we are very lucky to be joined by a student. 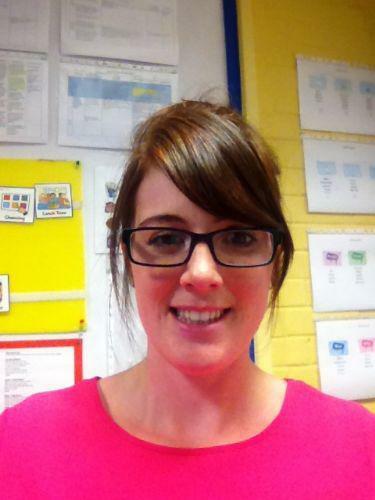 Her name is Miss Harding, she will be joining us until the Easter holidays. We have learnt a song about the sea and used instruments to make our song sound even better! 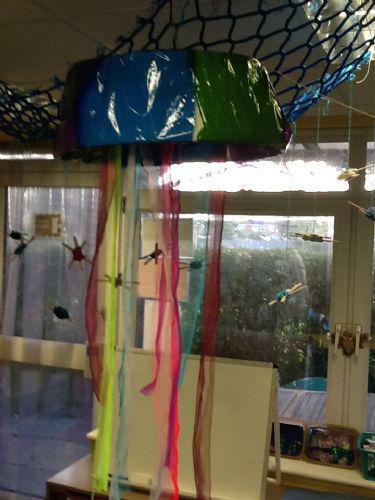 We made a giant jellyfish! We have been practising writing some sentences and making our writing neat. We have also been practising our sounds ready for phonics. We have been practising our counting and matching the amount to a number. 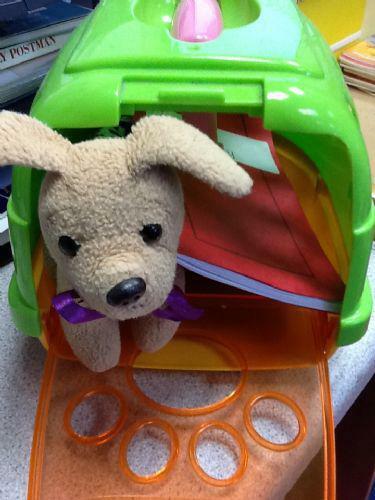 We also named our class dog 'Bobby' so that he is ready to visit us at home! We learnt the song 'Mark the shark' in our music lesson. In RE we made a display about God looking after us. In Art we made Sea Turtles by winding wool around lolly sticks, and we made pictures of under the sea using water colour and felt pens. 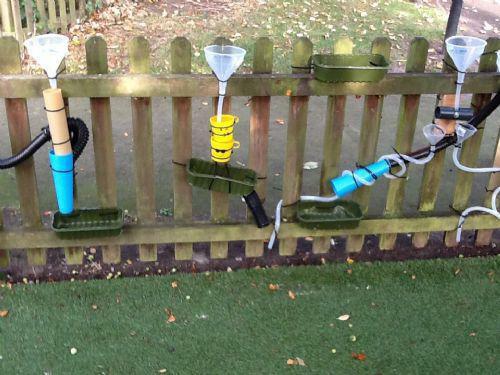 We made a water wall outside using recycled materials. 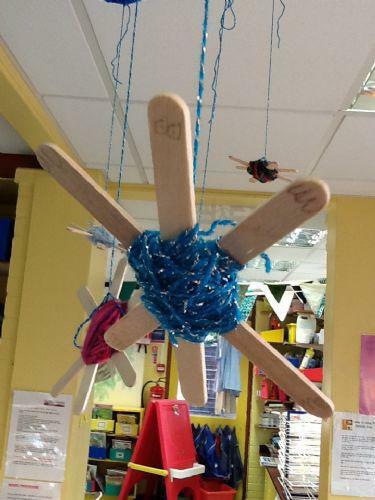 In English we made our own version of the 'Wish fish' by changing our story map. We also wrote lists of ingredients for fish food. In PE we played the Traffic lights game and a crab and fishes team games. In Music we made our own pieces of music by writing symbols for a friend to follow. In English we have been learning about writing facts and labels. In Science we were looking at animals, we needed to sort them out based on their physical features. 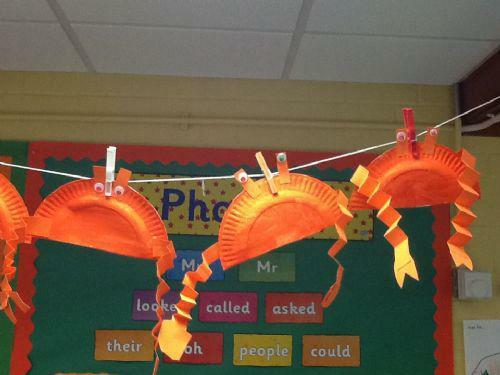 In Art we made our own paper plate crabs be careful that they don't pinch you! In RE we wrote our own prayers to God, based around the Psalms that we have been reading. In English we wrote sentences to make a paragraph about our likes and dislikes. In PE we have played parachute games. In Art we read the story of Bonting by Shirley Hughes and we made our own Bontings! In Maths we have been adding and taking away. We also started to learn about turning additions into subtractions. In Science we learnt about the seasons and found out facts about each season. 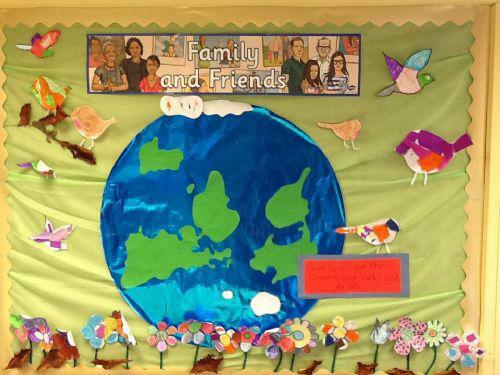 In Geography we learnt about the continents and the animals in each continent, the food eaten and the weather. In cooking we made Jelly Jellyfish! In Maths we have been working on our addition and subtraction. In Art, we made hand print mermaids in a bubbly sea. We also did some gardening and planted pretty flowers in our outside area. 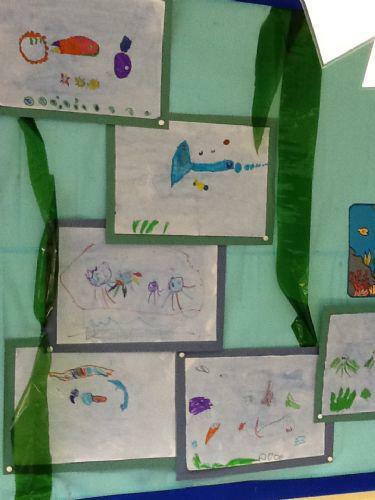 In English we have been writing poems about sea creatures. In PE we have been playing under the sea games, moving like different sea creatures. In Geography we made an information book all about creatures under the sea. In Science we learnt about how fish breathe, we watched an experiment to show us how the air moves. We have been learning about fireworks, we painted firework pictures in Art, we learnt about safety rules for fireworks, we made up some firework dances in PE, we cooked edible sparklers, we drew and labelled firework pictures and we made firework leaflets. In Maths we have been learning about turns and directions.